I'd like to think I'm not a tourist. 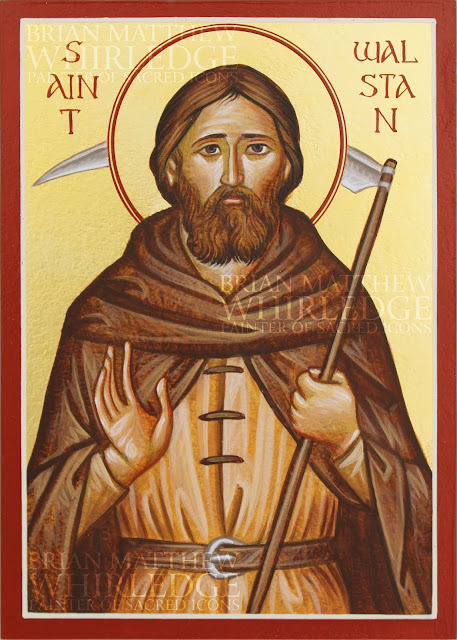 After all, I am Orthodox, while not making me Greek, it makes me an insider in many respects. 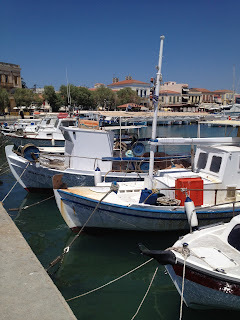 I also speak (some) Greek, definitely more than most tourists, but maybe not enough to live here. But I definitely know enough to get around and make shopkeepers and other random people smile...glad that a non-Greek cares enough to learn their language. My heart swells when someone approaches me and rambles in Greek (even though I have to ask them to repeat it slower). I am a student; my primary purpose of being in Athens is study. 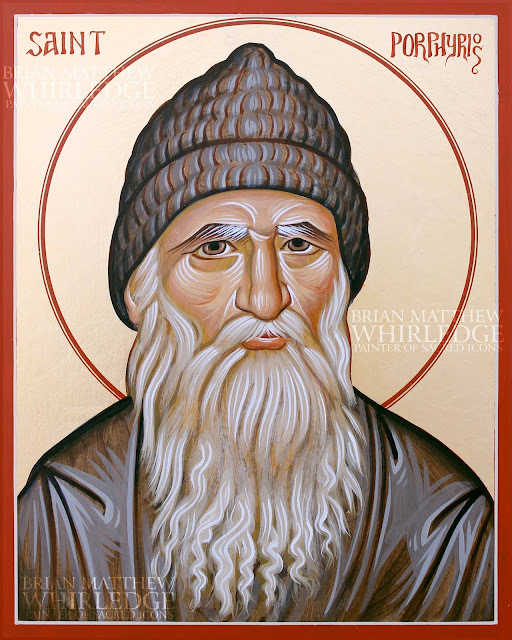 Not only that, but I am studying arts to specific to Orthodoxy. Besides all these things, I have observed some ridiculous tourist behavior, and have consciously avoided such. That being said, I've been here a week, and I'm now getting around to the touristy things. I admit, today, I was a tourist, no ands, ifs, or buts. I wore shorts, saw and did touristy things, took lots of photos, and bought a souvenir in tourist trap central. This morning, Bekah and I visited three different Agoras. "Agora" is Greek for a marketplace. 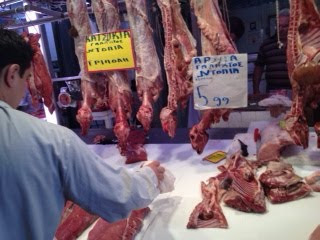 The first Agora was the Athens Central Market. Like the scooter ride, it is an experience that I'm glad I had, but one I do not wish to repeat. The market was packed...full of meat and yelling and a distinct aroma. Whole carcasses of every kind of livestock hung (heads intact in most cases), while butchers tried to hustle buyers. One reached out his meaty hand (in more than one sense) and grabbed my arm to get my attention (I definitely washed it well). We quickly exited the first door we found. 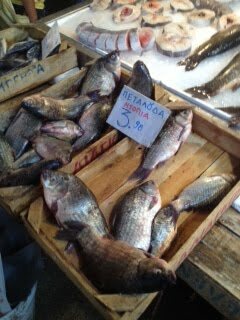 Unfortunately, it led to the fish market. The odor does not need description. All the vendors were wearing galoshes...and my sandaled feet could have used some. The floor was one giant puddle, and the tables were (literally) packed like sardines with every kind of sea animal imaginable (again, most with heads). 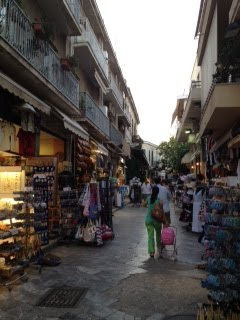 After the first agora, we went down Athinas street, through Monastiraki square, to Adrianou Street, which led to the second Agora, which was much easier on all the senses. 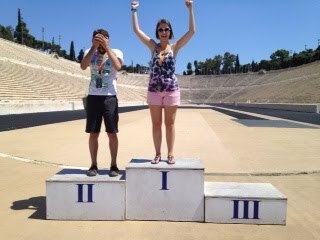 This second Agora of our day was, in fact, the first in Athens. 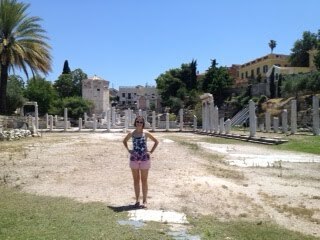 It was the ancient Agora of classical Greece (fifth century BC). The contemporary agora fresh in our minds (and noses), we could imagine how this agora once was: bustling with merchants and shoppers, and more, for this was where ideas were also exchanged by the philosophers. 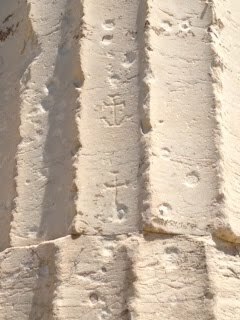 and Christian graffiti on many monuments. 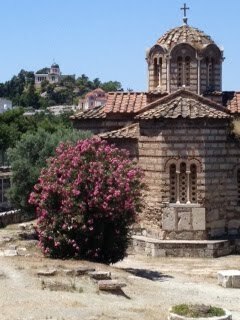 After the ancient Agora, we walked a block or so to the Roman Agora. Evidently, by Roman times (early second century AD), the old Agora was too crowded, so the Emperor Hadrian built this new agora. It remained in use as a market until the 19th century, even though the centuries have taken their toll on the structures. 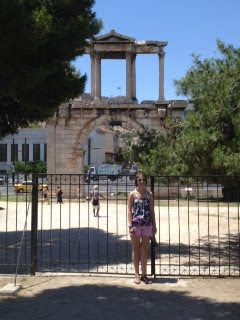 From the Roman Agora, we took Adrianou Street to Hadrian's Arch and the Temple of Olympian Zeus. Adrianou street is the oldest, continually used street in Athens. It was built by the Emperor Hadrian in the early second century to connect the old city to his new addition: his arch marks the entry to his new city. Adrianou street is now one lengthy tourist trap. 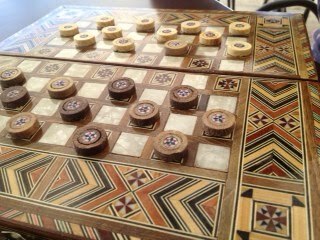 Since today I'm a tourist, I got sucked into a shop that had some really beautiful inlaid chessboards from Syria (OK, so my souvenir is not Greek...but I really don't need alabaster statues of pagan deities or a Spartan helmet). I've been wanting a chessboard for some time, and this one caught my eye...besides, it doubles as checkers and backgammon (OK, so I have to learn how to play backgammon...). 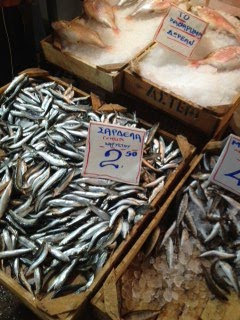 In my defense of buying a souvenir, the entire transaction was accomplished in Greek, including talking down the price. Bekah and I played checkers during lunch. 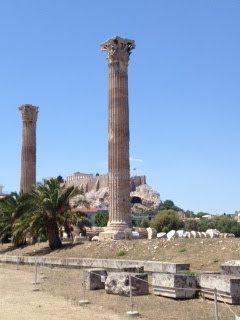 We continued down Adrianou street past Hadrian's Arch, to the temple of Olympian Zeus. This temple is amazing in its scale. A skyscraper is does not impress me...it is simply made of steel lifted high with cranes. This temple towers at 90 ft, and the columns are constructed of a stack of massive cylinders. How this was built remains a mystery to me. I found it interesting that in the early 19th century, a stylite (hermit monk) lived on top of one of these pillars as an ascetic act. The ancient Pan-Athenaic Stadium is just east of the Olympian temple. The stadium fell into disuse with the rise of Christianity (and fall of paganism), and was completely ruined over the centuries. 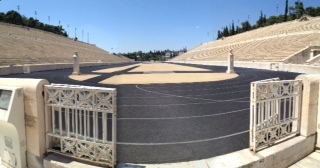 This impressive stadium was completely restored for the first (modern) Olympic games in 1896. There is a tunnel leading to holding chambers where the ancient contestants would have waited before entering the arena, some of whom were inevitably martyrs awaiting their fate. 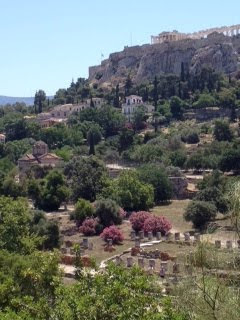 We ate a Greek salad for lunch at a cafe at the stadium, then walked through the National Gardens, past Syntagma, dodged some molitov cocktails (not really...it's just a park, I promise), and back to the apartment. After that was vespers at St. Irene. Angelopoulos gave me a warm welcome, and Tsiotsiopoulos invited me to join him in the left choir. 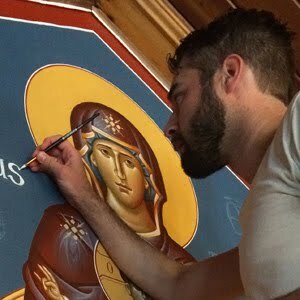 What a privilege to chant with such talented artists (I'm exaggerating...I'm not really chanting so much as just looking over their shoulders and try not to ruin it) and experience firsthand the best Byzantine chant in the world. 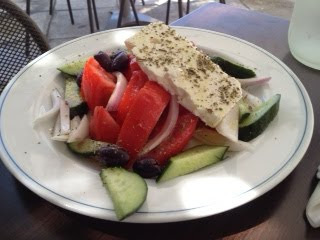 After vespers, I got some tomatoes, cucumbers, and feta at Bazaar, and Bekah made a delightful Greek salad, along with leftover octopus from yesterday. 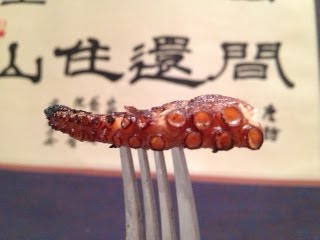 The octopus is still good, even though now I know where it came from.